We haven't really talked about our guest list before, and how we landed on the people that we ended up inviting to our wedding. I think Mr. Narwhal and I had a pretty typical guest list compilation experience. We wanted to keep our numbers low, but at the end of the day have a lot of great people in our lives that we wanted to include and share our day with. Do they have an active role in our lives? If the answer here was yes, they definitely made the list. When is the last time we saw them? Sometime friends trickle in and out of your life, this question was helpful for people that we were on the fence about. Did they play a significant role in our life before? We recognized that some guests may not be actively in our lives now, but played a huge role in our lives before. Some guests stayed on the list for this reason, even though they are not actively in our current lives. At the end of the day we ended up inviting 158 people to our wedding. This number does not include us, children or vendors. Since we are having a cocktail style reception, we left it up to parents whether they wanted to bring their children, and we have about 15 children coming for a portion of the evening as a result. 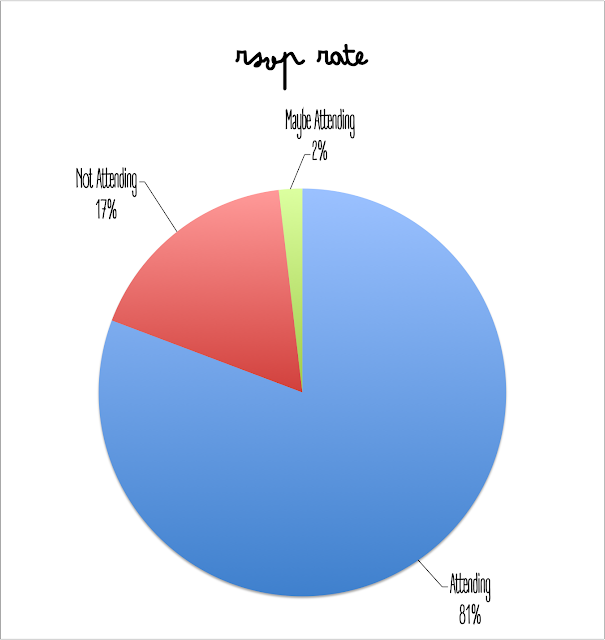 So, for the oh so fun (nerd alert) nitty gritty of our numbers, these numbers only include our adult guests. Overall we generally stuck to the 80% rule. We have a total of 130 adults attending, with three guests that are still unknown*. At one point it really did seem like we were going to have about 90% attendance; however as I'm sure many experienced, once the deadline hit, many people were unable to make it for a variety of reasons. I thought it would be interesting to note that the reasons guests are unable to make it include: conflicting weddings/events, budgetary reasons (guests that require a flight), having a baby, work, personal reasons and changes in relationship status. As you can see, Mr. Narwhal and I put a priority on our friendships for our guest list, with them making up the largest portion of our guests. I have a rather large family, which extends to second and third cousins that I'm close with, this is reflected in the skew between Mr. Narwhal and I's family. Mr. Narwhal has met every single person from my side of the family that is attending, and I personally will be meeting four of his family members at the wedding! 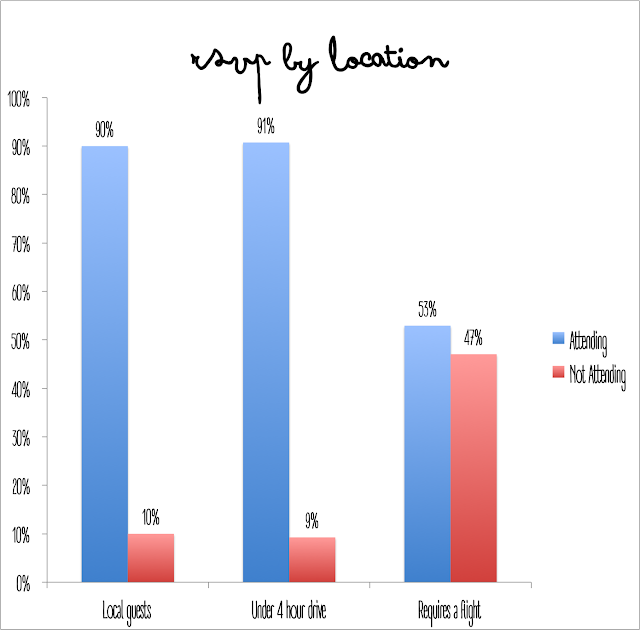 I find it interesting to note that when we consider location, we actually have about a 90% acceptance rate for most of our guests, but when you add flights into the mix (flying within Canada is very expensive), those guests only have a 53% acceptance rate. We certainly didn't expect any of our flying guests to make the journey; and while many of them tried to make it work, these were many of our last minute no responses. I think that mail-in RSVPs are quickly becoming a method of the past. Most are choosing to have a website response since postage is getting so dang expensive. 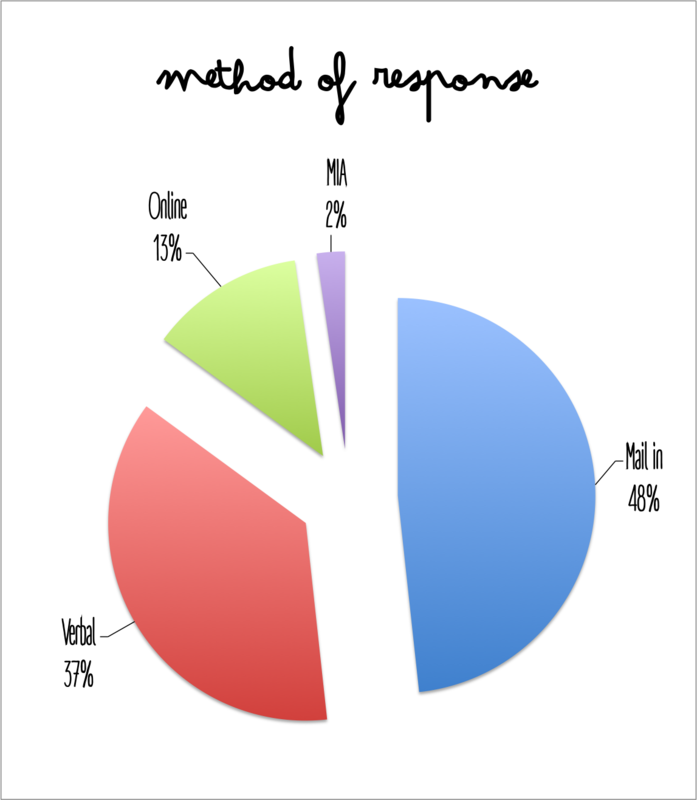 I thought it would be interesting to share how our guests chose to respond since we gave both a mail-in and online option. A very small portion of guests used our online option, with the majority choosing to mail in their RSVPs. That verbal response rate, closely followed (read: mostly bride and groom hunting down guests for responses). 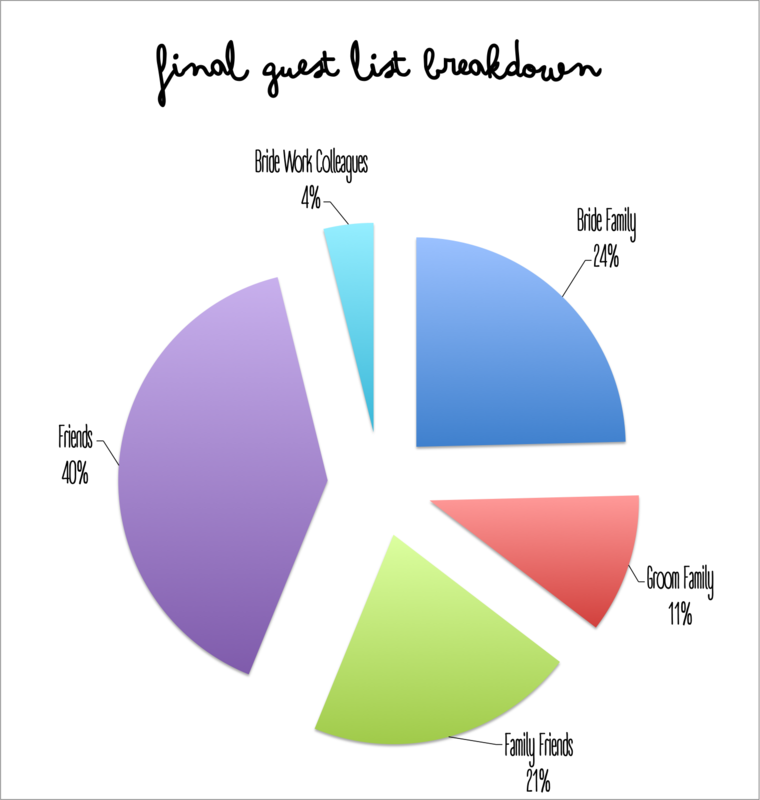 How did the numbers play out for your guest list? Did you fall into the 80% average? *The three guests are relatives that are not in the best health right now (including Mr. Narwhal's granddad) and will be making their decision closer to the date.